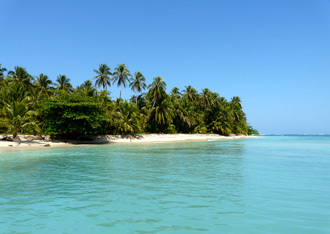 Bocas del Toro is located on the north-west coast of Panama, approximately 20 miles south of the Costa Rican border. Isla Colon is the island on which the main town, Bocas town, is situated (and Sunset Point is just around the corner from Bocas town). With approximately 10,000 residents in the entire Bocas del Toro archipelago, the sleepy seaside town of Bocas del Toro is the capital city of the province that shares its name. Bocas is accessible either by boat or air. Most travelers fly into Panama City and take a scenic one-hour flight to the Bocas airport, which is just minutes from Sunset Point. Until recently – thanks in large part to about a dozen countries having filmed their “Survivor” TV series here – Bocas has remained relatively undiscovered. Known for its friendly people and simple charm, the Bocas del Toro archipelago is composed of nine major islands, 59 smaller named islands, and countless uncharted mangrove cays.